See the best of the Bay Area in a convenient way with this 3-in-1 sightseeing package that introduces you to some of the most popular destinations in and around San Francisco. With this two-day package, visit Alcatraz Island, see the redwood trees at Muir Woods National Monument, and enjoy a comprehensive city tour of San Francisco's top sights. Package also includes a complimentary flight of wine, or a meal voucher to a local restaurant favorite. Due to popular demand, this package is likely to sell out. Advance reservations are required. The first day of your 3-in-1 sightseeing package begins by venturing over the Golden Gate Bridge to Muir Woods National Monument, an isolated canyon north of the city that's home to a grove of coastal redwood trees. Enjoy the tranquil, shady atmosphere as you stroll among 1,000-year-old trees that tower 260 feet (79 meters) tall. Depending on the conditions, you may experience Northern California’s signature fog while you wander in and out of the Mother Nature’s redwood alleyways. On your way back to San Francisco, enjoy a drive through the seaside town of Sausalito, a Mediterranean-like village that sits across from the city on San Francisco Bay, known for its sophistication, boutiques, and waterfront eateries. Your second activity is a highlights tour of San Francisco. Travel in comfort aboard a modern luxury coach to see attractions both trendy and historic within the city's 49 square miles. Drive through colorful neighborhoods and see sights recognizable from postcards; you'll make photo stops at the Golden Gate Bridge, Golden Gate Park, and Twin Peaks (weather permitting). Known as the Rock, Alcatraz Island is just a 30-minute ferry ride across the bay from the Embarcadero. Now operated by the National Park Service, the island prison was once home to such notorious inmates as Al 'Scarface' Capone and the 'Birdman' Robert Stroud. When you arrive on the island, grab an included headset for the 45-minute Cell house Audio Tour, which guides you through the cell block, cafeteria, and other areas as you listen to stories from the inmates themselves, as well as other residents of the island. 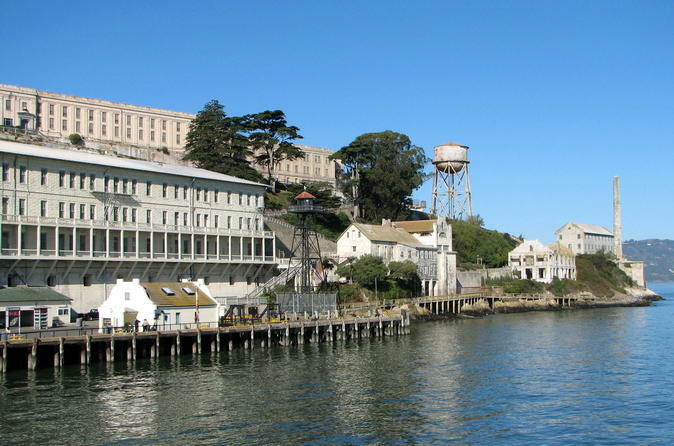 You can step inside a prison cell to get a feel for what it was like to be incarcerated there, and enjoy views of the bay, Angel Island, and the San Francisco waterfront. Your Alcatraz tour is self-guided; when you're finished, you may return to the city on whichever ferry you wish. Package also includes a Meal Voucher to Beach Street Grill - Enjoy breakfast or lunch at this Fisherman's Wharf staple featuring local favorites.